…on the eighth day of Christmas my green friend gave to me…eight straw bales…seven chocolate bars..six pounds of spinach…five milkweed plants…four smart bulbs…three Amazon Echos…two Ecobees…and a live Christmas tree! Let me begin with “Happy 2018”! May this year bring you good health and joy! My green friend and I have had several discussions about mulch and gardening after last year’s post on mulches. The subject of straw for mulching was debated for months and then “straw bale gardening” crept into the conversation as I was planning a raised bed garden but had little time to get it built and filled. Along came hurricane Irma in August and my plans for a raised garden were replaced with deconstructing my fallen fences and working on putting them up again. The frustrating part was they had just been erected 3 months before Irma after Matthew had blown them over in October, 2016. No, insurance did not cover any of this so it was up to me to deconstruct and reconstruct as finding help for small jobs like fences after a hurricane is somewhat impossible! I digressed a bit so let me come back to the eight straw bales my green friend delivered today. In case you don’t know the difference between straw and hay (like me), the hay bales are harvested by cutting off the tops of grains before they go to seed. It is used as feed for many farm animals since the nutrients are in the tops. Bales of hay are not taxed (here in FL) as they are considered food. Since the tops contain seeds hay is not the preferred material for gardening mulch or “bale” gardening. Straw bales consist of the bottom parts of the dried stalk and are quite a bit coarser which does make it better for mulch and perfect for straw bale gardening. Even better-the straw decomposes throughout the season and provides nutrients to the plants and to the soil! After reading several articles and blog posts today I have decided to set up my first straw bale garden like the one in the picture (probably without the white border). Since I have eight bales I will set up two parallel raised beds. I have decided to follow Kerry Michaels’ posts for guidance as I continue this project. I especially like the fact these “gardens” will be easily accessed raised beds and should I decide on a different location next year I can use the decomposed straw as compost next year and try another location. I’ll post updates and pictures of my garden as it evolves. 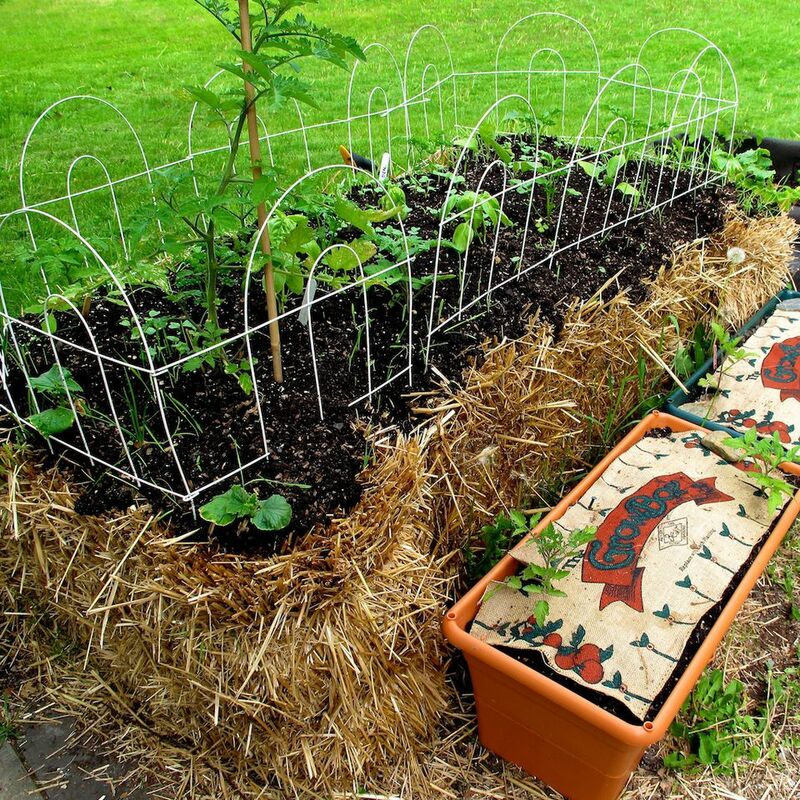 Have you ever tried straw bale gardening? If so, let me know how yours turned out and any tips you might be able to pass on to me. If this is the first post you have read of my Twelve Days of a Green Christmas and you can’t figure out what the heck I am writing about or why I’m writing about the Twelve Days after Christmas click here to read how this all began. Thank you for reading my rendition of the Eighth Day of Christmas and I hope you join me tomorrow for the Ninth Day of a Green Christmas!